Fresh whitebait are drained and chilled at Cascade and Waiatoto before being "tinned" into plastic containers and flown to the Christchurch depot. 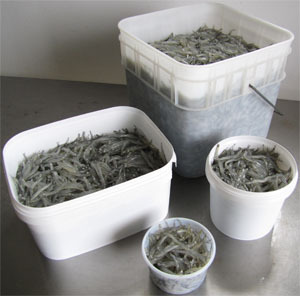 Once there the whitebait is packed into the required container sizes of each order and placed into polybins before being freighted to the customer. Great for counter display or tidy storage. Either clear or bar-coded. Fantastic for individual or small group servings. 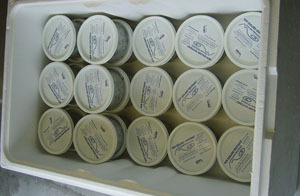 Most common fresh product container. Easily handled and stored. Great for redistribution and larger quantity requirements. An extra charge of $3 per kg applies for 250g pottles of fresh whitebait. An extra charge of $2 per kg applies for 1kg pottles of fresh whitebait. Cascade whitebait is packed in to plastic pottles and blast frozen to ensure no loss of quality occurs in the freezing process. Frozen orders are packed into polybins with slicker pads to ensure no loss of temperature during freighting. Clear or bar coded. Frozen whitebait is sold year round, subject to availability. Look great and promote the "Quality Product" selling point. The containers are microwave safe for quick, no mess thawing. A freight charge of $3 per kg applies for all orders. Orders over 50kg FREIGHT FREE. 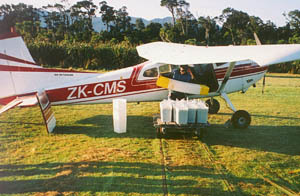 All whitebait products are over-night air freighted with Courier Post in polybins and chill packs. Cascade Whitebait can reach their end destination within 24hrs ensuring the product you buy is of premium quality. Available product sizes for fresh whitebait. Fresh whitebait order packed in polybin. Fresh whitebait available from 1 September - 14 November. Frozen Whitebait year round, subject to availability.